Decorfolia news - The birds and the bees. Honey bees and other pollinators have been under tremendous pressure over recent years, the wet summer of 2012 and the cold spring of 2013 have exacerbated an already difficult time. Modern gardening methods, nice tidy borders and blowzy, very elaborate hybridised flowers have made nectar and pollen unavailable to many species. Add to this the widespread use of pesticides in both gardens and agriculture and the outlook starts to look very grim indeed. However, our bees here appear to be flourishing, both bumble bees and honey bees, along with our butterflies and all manner of pollinators. 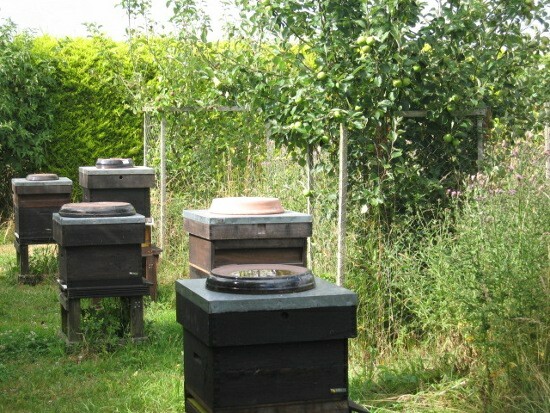 This is partly due to our approach to the care of the land here and also Mark's bee keeping methods. (He is currently writing an interesting newsletter about the bees which should be online very soon). The hedges that we planted back in 2009 are filling out and the rambling roses and honeysuckle look and smell fabulous. 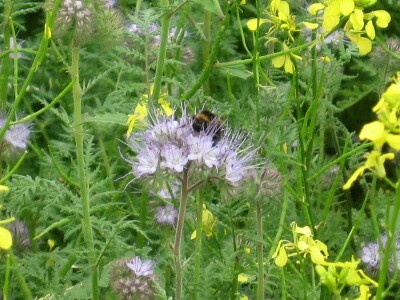 An area, roughly the size of a tennis court is planted with Phacelia 'tanacetifolia' (pictured below). This fast growing annual plant is available to gardeners as a "green manure", which by its nature is dug back into the ground before it flowers and seeds. However, if you leave it to mature, you will be astounded by the number and variety of pollinators working over the small flower heads. 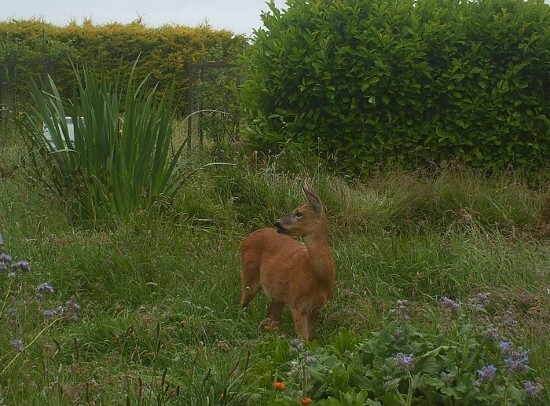 Yes it does spread to other areas, but it is very pretty and easy to control. Another plant we grow for the bees is Borage (good in Pimms too! ), the bright blue and pink flowers attract the bees like magnets. One plus side to modern gardening trends, many of you may have quite mature Cordyline 'Australis' in your garden, they were all the rage some years back and the surviving plants are now tall, multi-headed specimens that often have clustered white flower heads developing at the top. The sweet smell of the flowers is similar to Lime tree blossom and bees will travel large distances to work on the tiny flowers. Once the bees have done their work, leave the seed heads until the Winter and you will be visited by a murmuration of starlings (don't you just love collective nouns!). With thanks to my husband's woodworking skills we have a dozen or so bird boxes in the taller trees around the nursery and the various seed heads and choice of insects have given us some wonderful feathered neighbours. For me the most exciting has been a tiny gold-crest, but unfortunately I didn't have the camera handy. Following a winter attack on the bee hives, visits from the local woodpecker population aren't quite so popular! 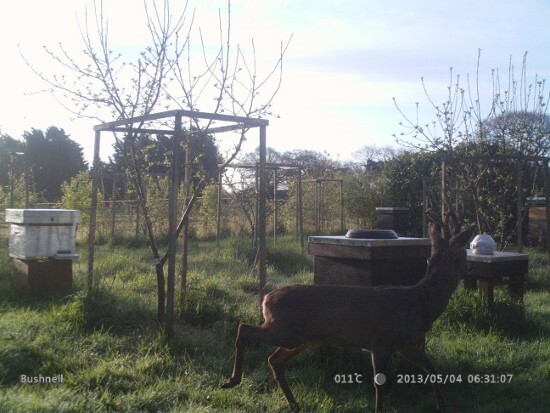 Our mammal population is quite varied, of course Iggy our cat, deer, rabbits, fox, hedgehogs (but sadly not often) and the occasional squirrel are seen and sometimes photographed. 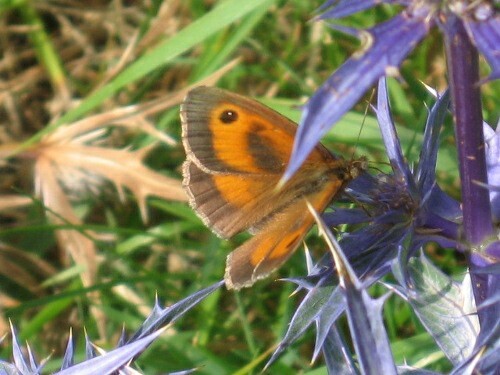 Butterfly on Eryngium (sea holly). This plant has self set on the nursery and the polinators of all types seem to love it. This shows how much the 'meadow' has changed since we created it in 2008. Notice how much the hedges have grown. 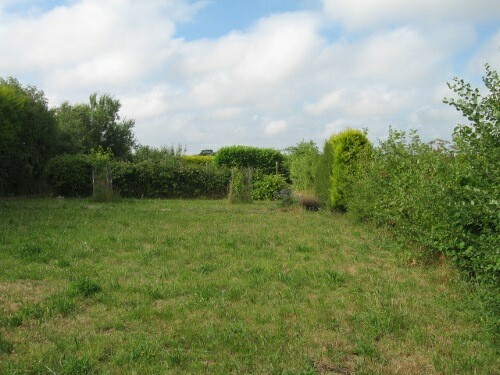 See news letter 'Our wildlife meadow...' of 2009 to compare.